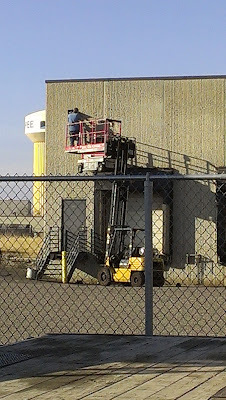 A forklift used to lift a scissor lift! Lets not go down the safety route shall we! I think that whether you should rent or buy your equipment depends on how much you plan to use it. Yes this doesn't look very safe. Maybe hire the right type of equipment next time! Thanks for informative safety tips! I would like to add one more is any repairs or adjustment necessary for the safe operation of the equipment must be made before the equipment is used and also make sure that each set of operating controls on the lift has an emergency stop device that is within easy reach of the operator and is clearly labelled STOP.